The Confederation of the Rhine (German: Rheinbund; French: officially États confédérés du Rhin ("Confederated States of the Rhine"), but in practice Confédération du Rhin) was a confederation of client states of the First French Empire. It was formed initially from 16 German states by Napoleon after he defeated Austria and Russia at the Battle of Austerlitz. The Treaty of Pressburg, in effect, led to the creation of the Confederation of the Rhine, which lasted from 1806 to 1813. The members of the confederation were German princes (Fürsten) formerly within the Holy Roman Empire. They were later joined by 19 others, altogether ruling a total of over 15 million subjects providing a significant strategic advantage to the French Empire on its eastern frontier by providing a separation between France and the two largest German states, Prussia and Austria, to the east, which were not members of the Confederation of the Rhine. On 12 July 1806, on signing the Treaty of the Confederation of the Rhine (German: Rheinbundakte) in Paris, 16 German states joined together in a confederation (the treaty called it the états confédérés du Rhinelande, with a precursor in the League of the Rhine). Napoleon was its "protector". On 1 August, the members of the confederation formally seceded from the Holy Roman Empire, and on 6 August, following an ultimatum by Napoleon, Francis II declared the Holy Roman Empire dissolved. Francis and his Habsburg dynasty continued as emperors of Austria. In return for their support of Napoleon, some rulers were given higher statuses: Baden, Hesse, Cleves, and Berg were made into grand duchies, and Württemberg and Bavaria became kingdoms. Several member states were also enlarged with the absorption of the territories of Imperial counts and knights who were mediatized at that time. They had to pay a very high price for their new status, however. The Confederation was above all a military alliance: the members had to maintain substantial armies for mutual defense and supply France with large numbers of military personnel. As events played out the members of the confederation found themselves more subordinated to Napoleon than they had been to the Habsburgs when they were within the Holy Roman Empire. After Prussia lost to France in 1806, Napoleon cajoled most of the secondary states of Germany into the Confederation of the Rhine. Eventually, an additional 23 German states joined the Confederation. 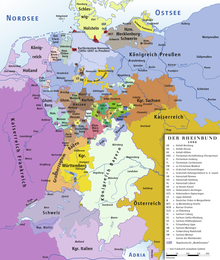 It was at its largest in 1808, when it included 36 states—four kingdoms, five grand duchies, 13 duchies, seventeen principalities, and the Free Hansa towns of Hamburg, Lübeck, and Bremen. In the German lands, only Austria, Prussia, Danish Holstein, and Swedish Pomerania (plus previously independent Switzerland) were not included in the Confederation, not counting the west bank of the Rhine and the Principality of Erfurt, which were annexed outright by the French empire. The Confederation of the Rhine collapsed in 1813, in the aftermath of Napoleon's failed campaign against the Russian Empire. Many of its members changed sides after the Battle of Leipzig, when it became apparent Napoleon would lose the War of the Sixth Coalition. The first group formed the "Model States" , which were mostly ruled by relatives of Napoleon. 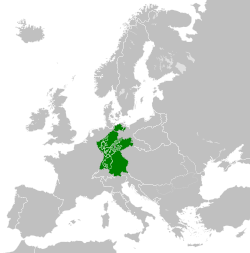 These include the Kingdom of Westphalia under Jérôme Bonaparte. The Grand Duchy of Berg was first administered by Joachim Murat and after his appointment as King of Naples (1808) after receiving a commission by Napoleon. 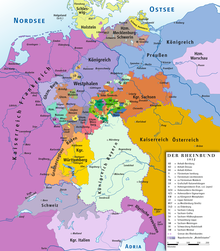 The third model state was the Grand Duchy of Frankfurt, which was run by House Dalberg until 1813. Because of the collapse of the Napoleonic supremacy, this position could no longer justify its own existence. These new foundations were intended to serve as a model for the remaining Rhine federal states through their legal and social policies. 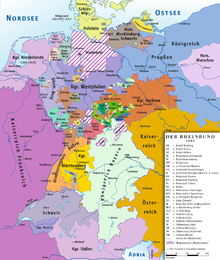 The second group were the reform states of Bavaria, Württemberg, Baden, and Hesse-Darmstadt. These were not dependent areas, but in many ways Napoleon's true allies. Although these states took inspiration from the French model, they also went their own way. The historian Lothar Gall suggested that the rulers of the Confederation of the Rhine were made revolutionaries by Napoleon himself. An opposition to the emperor would have been possible only by renouncing the power that he had given to them. "He had not made satellites which were politically incapable of action and forced to be obedient through use of force, but real allies who followed in his well-understood policy reasons of state." A third group formed the states that joined after 1806. These included the numerous smaller northern and central German territories, except for Saxony. In these, the internal changes were minimal. The reforms remained significantly limited in these states. However, there were also considerable differences among these states. In Mecklenburg and Saxony, the old structures remained almost unchanged. In the Duchy of Nassau, on the other hand, Minister Ernst Franz Ludwig Marshal von Bieberstein ensured moderate administrative modernisation, and the introduction of religious tolerance. The following table shows the members of the confederation, with their date of joining, as well as the number of troops provided, listed in parentheses. Member states of the Confederation of the Rhine, 1806. Member states of the Confederation of the Rhine, 1812. The allies opposing Napoleon dissolved the Confederation of the Rhine on 4 November 1813. After its demise, the only attempt at political coordination in Germany until the creation on 8 June 1815 of the German Confederation was a body called the Central Administration Council (German: Zentralverwaltungsrat); its President was Heinrich Friedrich Karl Reichsfreiherr vom und zum Stein (1757–1831). It was dissolved on 20 June 1815. On 30 May 1814 the Treaty of Paris declared the German states independent. In 1814–1815, the Congress of Vienna redrew the continent's political map. Napoleonic creations such as the huge Kingdom of Westphalia, the Grand Duchy of Berg and the Duchy of Würzburg were abolished; suppressed states, including Hanover, the Brunswick duchies, Hesse-Kassel and Oldenburg, were reinstated. On the other hand, most members of the Confederation of the Rhine located in central and southern Germany survived with minor border changes. They, along with the reinstated states, Prussia and Austria formed the German Confederation. ^ a b c d Hans A. Schmitt. Germany Without Prussia: A Closer Look at the Confederation of the Rhine. German Studies Review 6, No. 4 (1983), pp 9-39. ^ Berding, Helmut (1973). Napoleonische Herrschafts- und Gesellschaftspolitik im Königreich Westfalen 1807–1813. Göttingen/Zürich: Vandenhoeck & Ruprecht. ^ Gall. Liberalismus als regierende Partei. p. 85. ^ Siemann. om Staatenbund zum Nationalstaat: Deutschland 1806-1871. pp. 23–24.